– 74% of all Americans do not get enough sleep each night. So, most Americans feel sleepy or groggy during the day. – 51% of adults say they have problems sleeping at least a few nights each week. – Almost one third of Americans have trouble sleeping every night. 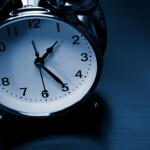 – Half of all Americans cannot get up without an alarm clock. So, the alarm clock is interrupting sleep cycles causing a lack of energy and an unrefreshed feeling in the morning. This short study of King David reveals what keeps us up at night and what to do about it.